All six frame keeps have now been machined to the stage of trial fitting. The drilling of the holes to secure the keeps to the frame plates was done with our own magnetic base drill with the frame keeps clamped securely in position. The final machining operations are drawing to a close with the milling of a chamfer on the back edges and spot facing the holes. The various brackets for cab support and mechanical lubricator support are being drilled and painted and a support bracket for the driver's pedestal is being made. 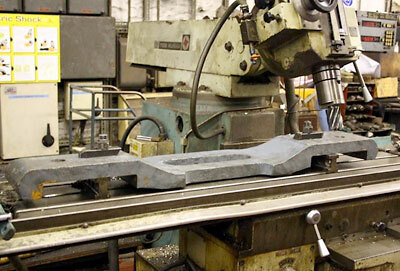 Meanwhile, the contract for casting and machining the left hand and right hand motion brackets has been awarded to The Boro' Foundry Ltd. of Lye, Stourbridge and the patterns made by Brian Oldford which may be seen in Newsletter No13, have been delivered to them. 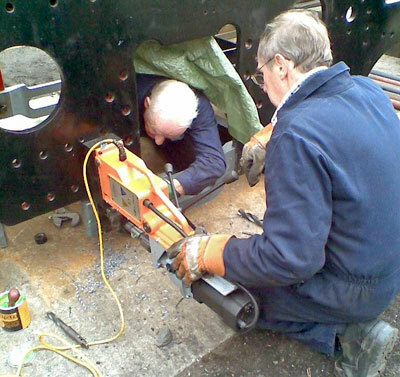 Fabrication of the smokebox saddle is close to completion and it will then be moved to Dudley for machining. We are looking forward to seeing this impressive piece of kit mounted on 82045. We are very pleased to see Phil Harvey back on the regular team after his knee replacement operation. Phil is a Lloyds coded welder, and his expertise in welding is invaluable. He has been making some backing plates for the horn guide and horn block liners and is now fabricating the support bracket for the driver's pedestal. Welcome back, Phil! Don't forget that the AGM is almost upon us: Saturday 2nd April at 2.00 p.m. in the upstairs lecture theatre at Kidderminster Railway Museum. All are welcome, and we hope for a good turnout. With 82045 coming on apace there is plenty to talk about, so it should make for an interesting afternoon. "That’s a class three act if I ever saw one”. Well done Mike! "The competition for Mr Universe hots up as the finalists are announced." from Adrian Parker. "The 82045 SLT quoits team celebrates yet another thrashing". from Dr.Steve Quarrie. Thank you to all who joined in this bit of fun and congratulations to Mike Smith. 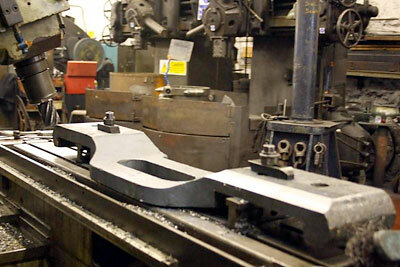 One of the frame keeps set up on the small milling machine. The chamfer machined on the edge of the frame keep nearest the camera with the far edge about to be done. Peter and Bryan using the magnetic base drill to deepen the countersink in the holes of the frames in readiness to accept the countersunk headed bolts which will secure the frame keeps.